Ferdinand George William Berthoud is a bit of a mystery. Born on August 15, 1878, near Herefordshire, England, he was the son of George William Berthoud (1845-1884), a native of Switzerland and perhaps a relative of the Swiss horologist Ferdinand Berthoud (1727-1807). Both men were born in fact in the city of Neuchâtel. Ferdinand G.W. Berthoud's father died when he was a child. His family was reduced to himself, his mother, born Anne (or Ann) Elizabeth Slade, and a younger sister, Isabella. The 1891 census in England lists Berthoud, age thirteen, as a "scholar." He studied surveying in his youth. In 1896, he went to South Africa. The next public record has Berthoud in South Africa with the 2nd Kitcheners Fighting Scots and participating in the Second Boer War (1899-1902). After the war, Berthoud remained in South Africa, where he consciously or unconsciously gathered material for his later work as a novelist and short-story writer. At the end of 1907, Berthoud, aged twenty-nine and occupied as an engineer, traveled from Southampton, England, to New York City. He gave his permanent residence as Johannesburg, South Africa. Berthoud's move may have been temporary or permanent, but by the time he registered for the draft in 1918, he was employed as an inspector by the Locomobile Company of America in Bridgeport, Connecticut. He also lived in Freeport, Maine, for a time (ca. 1931). Berthoud suffered a double blow in the early 1920s. In February 1920, his mother died in England. A year and a half later, his wife, Canadian Elizabeth Maude Slade, contracted appendicitis and passed away in Boston. (Yes, strangely enough, Berthoud's mother was named Anne Elizabeth Slade and his wife was named Elizabeth Maude Slade.) Whatever other effect those two events may have had on Ferdinand Berthoud, he began to write. From about 1921 onward, Berthoud sold stories to Ace-High Magazine, Argosy, Blue Book, Brief Stories, New Stirring Adventures, Short Stories, Strange Tales, Thrilling Adventures, Triple-X Magazine, and Wide World Adventures. Weird Tales published just one story by Berthoud, "The Man Who Banished Himself" (January 1924). Berthoud also wrote novels: Legs Parsons: A Story of Up-Country (1925) and Exiles to Heaven (1935). 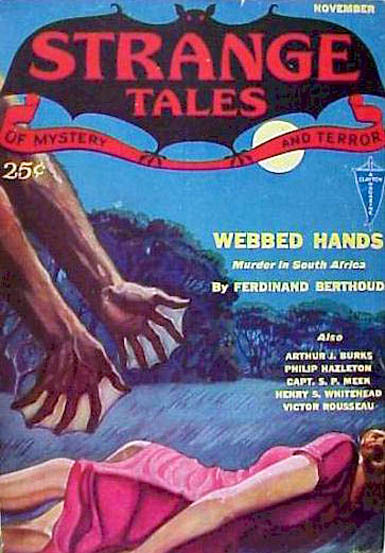 The former is set in South Africa (actually I believe in Rhodesia), as were several of Berthoud's other works, including "Webbed Hands," his cover story for the December 1931 issue of Strange Tales. The mystery to me is this: South African science fiction fans and literary scholars consider Berthoud one of their own. Berthoud lived in the United States as early as 1918, perhaps as early as 1907. Did he travel to Africa after arriving here? Or did everything he wrote about Africa come from his years on that continent early in the century? Another fact, a curiosity, then another question: First, a fact: In 1942, when he filled out his second draft card, Berthoud was living in Manhattan. Then a widower, he gave his contact as "Ed Bodin." Now a curiosity: I assume that could mean just one man, i.e., Edward Longstreet Bodin (1894-1983), author, agent, occultist, mystery writer, and contributor to Strange Stories and Thrilling Mystery magazines. Bodin was also the literary agent of the science fiction author and originator of Dianetics, L. Ron Hubbard (1911-1986). And Bodin succeeded Bernarr Macfadden at the helm of the Macfadden Foundation soon after Macfadden's death. 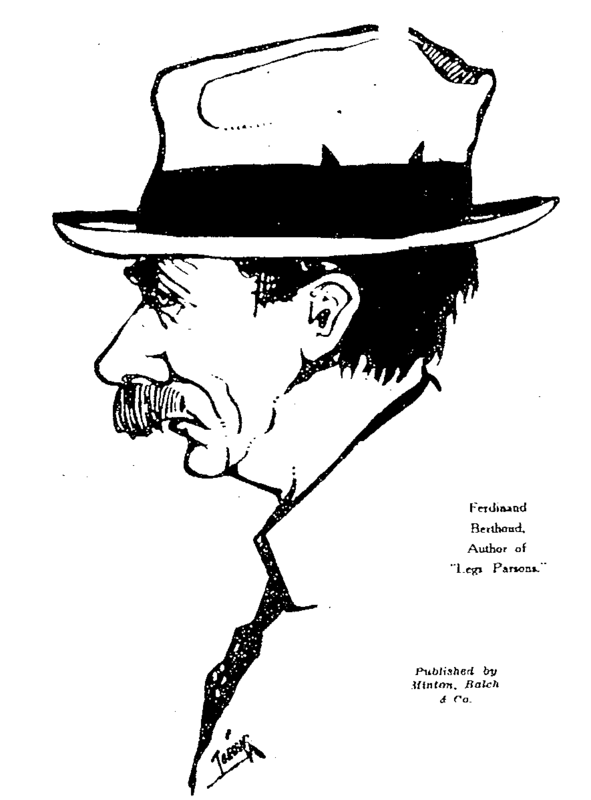 Macfadden (1868-1955), an advocate of physical culture and founder of his own belief in "cosmotarianism," was also a very successful publisher of pulp magazines, including True Detective and Ghost Stories. Berthoud's listing of the agent Bodin as his contact would suggest that even in 1942, Berthoud was still active as a writer. Finally, a question: When and where did Ferdinand Berthoud die? "Down and Outer Does Not 'Jibe'" by Ferdinand Berthoud in the Boston Globe, March 23, 1913, page 71. When we were children, we sang a song called "We Are Marching to Pretoria" without knowing what the song meant. 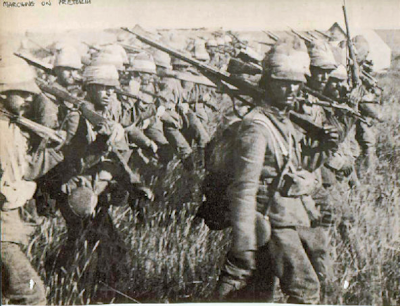 This photograph from the Boer War offers some clues. Writer Ferdinand Berthoud, a veteran of the war, may very well have worn a uniform like this one. He may even have sung the song. We often engage in strange and inexplicable activities. 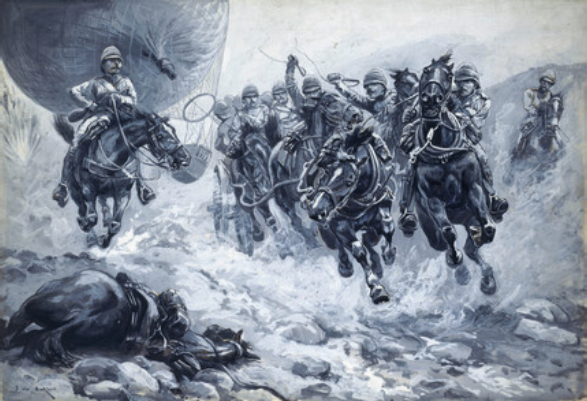 Here's an example: British cavalry escorting an observation balloon during the Boer War. Artist Sir Frederick William Burton (1816-1900) must have created this illustration in the last year of his life. Note the man with the moustaches on the far left in both images. Strange Tales of Mystery and Terror for November 1931 with a cover story, "Webbed Hands," by Ferdinand Berthoud and cover art credited by some sources to H.W. Wesso (1894-1948). Berthoud's story is a weird mystery set in South Africa. Arthur J. Burks, S.P. Meek, Henry S. Whitehead, and Victor Rousseau also contributed to Weird Tales.